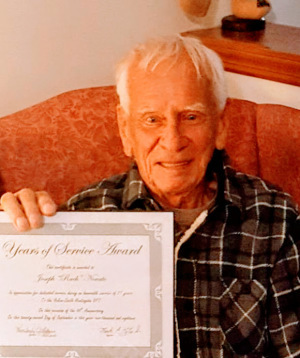 Obituary for Joseph Novota | Beatty-Rich Funeral Home, Inc.
Joseph Novota, 95, of Herminie, Pa. died Wednesday December 5, 2018 at the Excela Westmoreland Hospital. He was born July 15, 1923 in Yukon, Pa. Son of the late Robert and Josephine Fabian Novota. He was a veteran of World War II serving in the Battle of the Bulge. After being discharged from the service, he was employed as a brick layer through the Labor International Union of North America, until his retirement. Joseph was a member of the Yukon Volunteer Fire Department for 77 years. He loved hunting and fishing at his camp. He enjoyed driving around and was an avid bowler for many years. He is preceded in death by both parents, two sisters – Virginia Novota DeTorres and Frances Novota Morvetz and one brother – John Novota. He is survived by one sister – Ethel Novota Shupe of Cincinnati, OH. and many nieces and nephews. Friends will be received from 12-2 pm Saturday December 8, 2018 at the Beatty-Rich Funeral Home, Inc. Rt 136 Madison, Pa. 15663. Members of the Yukon Volunteer Fire Department will hold a service at 1:45 pm Saturday. Followed by interment at the Seven Dolors Catholic Church Cemetery in Yukon, Pa. with full military honors accorded by the Armbrust Veterans. To leave an online condolence, please visit www.beatty-richfuneralhome.com.